Opioids are drugs that relieve pain. There are 2 types of opioids; prescription and non-prescription. Examples of prescription opioids include codeine, morphine, hydromorphone and fentanyl. Prescription opioids are prescribed by licensed health care providers to treat acute and chronic pain. Heroin and illicit fentanyl are examples of non-prescription opioids. Non-prescription opioids are made in unregulated labs and can be more lethal than other street drugs. Prescription and non-prescription opioids use can result in problematic use (causes social, economic, health or relationship harms) or dependency (the body will experience withdrawal symptoms if opioids are not taken). Anyone who uses opioids is at risk of experiencing an overdose. What are the health effects of taking opioid? When opioids are used as directed under medical supervision there is low risk of addiction and poor health outcomes. Anyone who takes opioids regularly will develop physical dependency, meaning that the person will experience withdrawal symptoms in as little as 6–12 hours after they stop taking them. Opioid withdrawal is rarely life threatening. Some of these symptoms may take longer to go away such as drug cravings. How would I know someone is having an opioid overdose? Opioids are depressants which cause the body’s central nervous system to slow down. 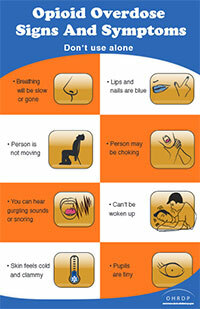 Below are signs & symptoms that someone may be having an overdose related to opioids. Who is at risk of having an opioid overdose? Anyone who is taking opioids is at risk of having an overdose. There is no formula to tell us who is going to have an overdose and who is not. How can an opioid overdose be prevented? Only take them when they are prescribed. Take back unused opioids to your pharmacy. Mixing opioids with alcohol and/or anti-anxiety medication like Ativan or Xanax increase your risk of overdosing. Your body will continue to need more and more opioids in order to get the same desired effect (this is tolerance). Your built up tolerance can start to drop after only 2–3 days of not using an opioid. If you haven’t used in a few days, decrease your dose, and slowly increase. If you are not taking an opioid that came from a pharmacy you cannot be sure what is in it. Many other street drugs like heroin and cocaine are cross contaminated with non-prescription opioids like fentanyl. If you use along nobody will be there to help you if you run into trouble. Try to use where other people you trust are around. Have someone you trust check on you. What kinds of resources are available for people who use opioids? Opioid use, like all substance use, happens along a spectrum from not using to dependency. Below are some of the local resources. Needle Syringe and Safer Inhalation Program; offering single use drug equipment to reduce the spread of infections such as Hepatitis B, Hepatitis C and HIV. Free nasal spray naloxone kits to people who use substance and their family members and friends. A locally driven initiative of community partners working together to move harm reduction strategies forward across Leeds, Grenville and Lanark.